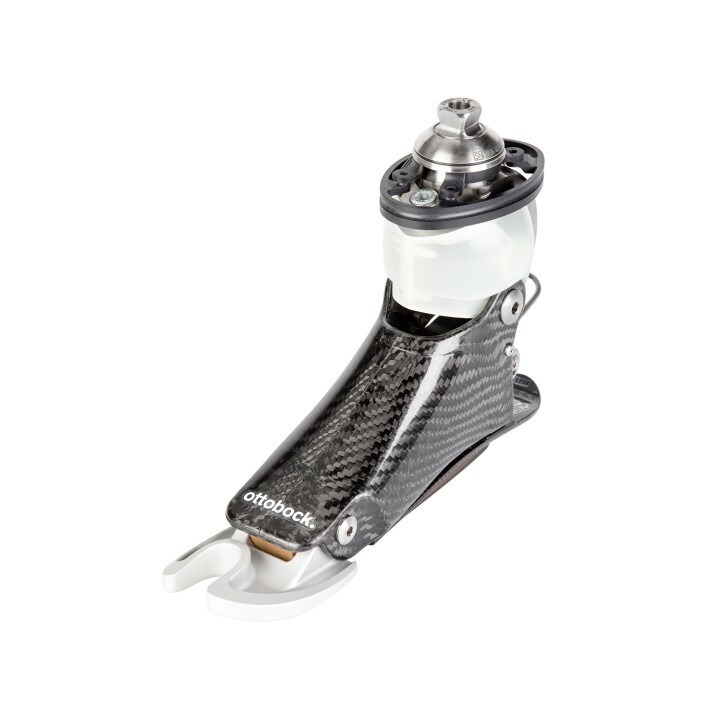 The new Meridium prosthetic foot offers you a high level of security along with increased adaptability and a more natural motion sequence. 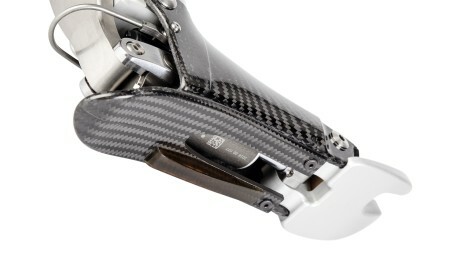 The unique 4-axis design with hydraulic real-time control therefore adjusts itself immediately to the user’s walking speed and ground conditions, whether on slopes, stairs or varying terrain. When sitting, the complete foot lowers itself to the floor, which provides relief for the residual limb. Because of its automatic heel height adjustment, the Meridium is suitable for various types of shoes. The times when frequent shoe changes gave you a headache are a thing of the past. With the Meridium, you can quickly and easily adapt the heel height to your shoes, whatever the occasion. 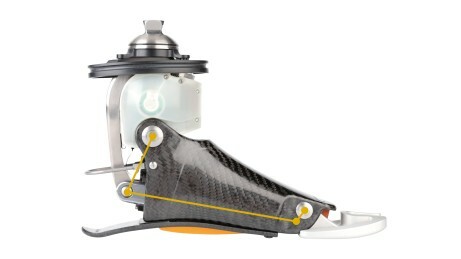 Layers of extremely stable, ultra-light carbon fibre laminate connect the hydraulics in the foot with the pyramid adapter and enclose the electronics and battery in the ankle. The hydraulics control the resistance and the motion of the foot (plantar flexion and dorsiflexion), thereby uniting flexibility and stability. 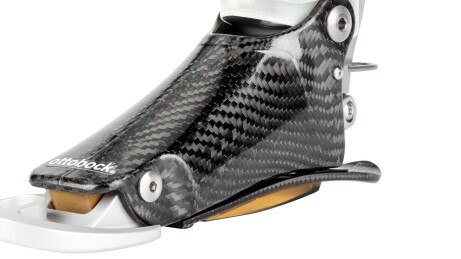 The frame and heel spring made from carbon fiber stand out for their high stability and stiffness and also help to protect the hydraulics. The heel spring dampens the step at heel strike. The battery and electronics are protected within the ankle area. The integrated microprocessor monitors the sensor data and controls the hydraulics in real time. 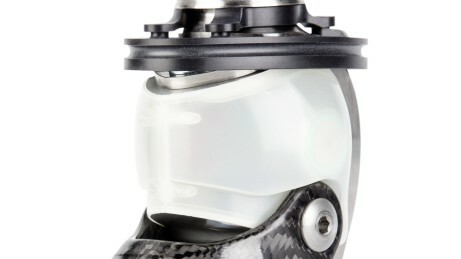 The toe plate made from aluminium with an isolated big toe also forms the link between the carbon frame and the frontal rotation point of the hydraulics. Due to its mobility, extensive ground contact is achieved during rollover. Movements and forces that occur are recorded using highly precise 3D, angle and moment sensors. They provide important information to the microprocessor regarding the situation and gait pattern in order to adapt the Meridium accordingly. The 4-axis kinematics enable particularly good adaptation to natural motion patterns when walking. 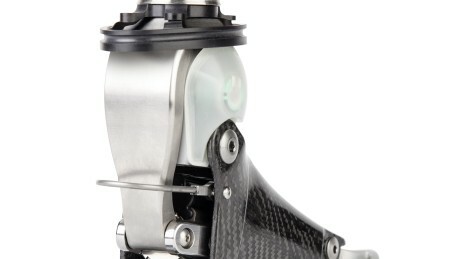 Four axles flexibly connect the toe plate, foot and ankle with one another. Click here to request a free trial of the Meridium foot. Real-time sensing of the ankle motions and slopes allows you to master ground inclinations effortlessly from the very first step. Increased security thanks to more ground clearance when ascending, comfortable descending thanks to the adapted rollover and fast full-surface ground contact. The Meridium adapts to the terrain with every step. No matter whether cobblestones, lawns or forest paths – real-time adjustment and improved ground contact mean it offers a high level of stability over different types of terrain. The Meridium enables you to place your complete foot on the step as you go down stairs. Instead of thinking about the correct placement of your foot, you can concentrate on your surroundings. Meridium identifies intuitively when you are no longer moving and require a secure, stable stance – even on slopes or uneven terrain. When sitting, the Meridium lowers itself to the floor, which both achieves a more natural-looking foot position and also helps to relieve your residual limb. No matter whether barefoot, flat soles or heels – the automatic heel height adjustment allows shoes to be changed quickly and easily. 1) The hydraulic resistance is adjusted during initial ground contact to achieve a comfortable heel leverage adapted to the user’s stride length. 2) Based on the individually adjusted plantar flexion resistance, the foot lowers itself according to the gait situation with every step. 3) The wide range of motion and real-time adjustment allows full-surface contact with the ground for the greatest possible stability and excellent traction. 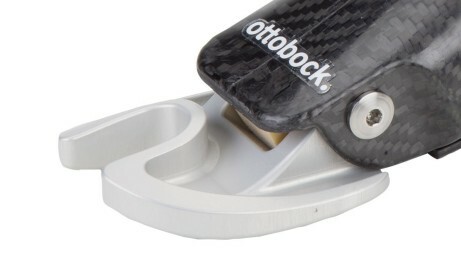 4) The movable toe plate provides a large contact surface and ensures uniform pressure distribution in the forefoot area when rolling over the foot at the end of the stance phase. During foot rollover, the Meridium’s four axes cause the ankle joint to plantar flex (foot lowering), which helps keep the body’s centre of gravity from lowering during walking. This enables a more even and more natural gait pattern while preventing tiring compensating movements. 5) If the foot is lifted from the floor, the hydraulics maintain an extended dorsiflexion position in order to allow greater ground clearance in the swing phase, while simultaneously achieving a higher degree of safety when walking. 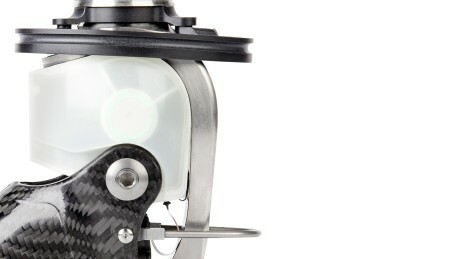 The Meridium adjusts itself automatically to a wide range of situations. Using the convenient Cockpit app for Android, you can also easily adjust the Meridium via smartphone. The app can be used to change the heel height, for example, or to select from a range of preset MyModes. The app also displays additional information such as the charge level of your mechatronic prosthetic foot. Alternatively, simple motion patterns or the optionally available remote control can be used to carry out adjustments. Learn more and download the Cockpit app.